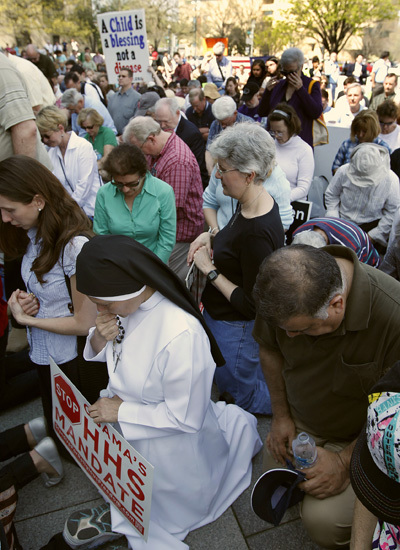 WASHINGTON (CNS) — The final rules issued June 28 by the U.S. Department of Health and Human Services implementing its mandate that employers provide coverage of contraceptives “will require more careful analysis,” New York Cardinal Timothy M. Dolan said in a statement. The HHS final ruling updates proposed rules the department had issued in February and left open for comment through April. The HHS contraceptive mandate, part of the Affordable Care Act, will require most employers, including religious employers, to provide coverage of contraceptives, sterilization and some abortion-inducing drugs free of charge, even if the employer is morally opposed to such services. It includes an exemption for some religious employers that fit its criteria. Cardinal Dolan said June 28 that he appreciated the “five-month extension on implementing the complex proposal,” meaning the government extended its “safe harbor” period to Jan. 1, 2014, protecting employers from immediate government action against them if they fail to comply with the mandate. Before the final rules were released, that period was to end Aug. 1 of this year. The Becket Fund, a nonprofit, public interest law firm that has represented Catholic and other religious institutions in a number of the lawsuits against the HHS mandate, said the new ruling is not much different from the proposed rules the HHS issued in February. “The news about the final rule is pretty simple: It’s more of the same,” said Eric Rassbach, deputy general counsel for the Becket Fund for Religious Liberty. “Essentially, we’re where we’ve been all along; the change now is it is final,” he said, adding that unresolved issues will have to be addressed by the courts. Still at issue, he said, is that self-insured religious groups need to hire administrators to pay for abortifacients and contraceptives and owners of for-profit businesses who because of their religious beliefs are morally opposed to the mandate will have to provide abortion-inducing drugs or pay up to millions of dollars in fines. In February, HHS said that in order to clarify what kinds of organizations may qualify for the exemption, it was eliminating the first three prongs of its original four-pronged definition of qualifying religious organizations and clarifying the application of the fourth prong, which stated that an exempt entity would be a nonprofit organization under specific sections of the Internal Revenue Code. According to the HHS final rules, the group health plans of religious employers are exempt from having to provide contraceptive coverage. The final rule provides accommodations for nonexempt, nonprofit religious organizations that object to contraceptive coverage on religious grounds. The HHS final rules also stipulate that nonprofit religious organizations do not have to contract, arrange, pay or refer for contraceptive coverage. It does not make this stipulation for for-profit organizations even those whose owners object to the HHS contraceptive mandate. In an HHS telephone news conference, Michael Hash, director of the Office of Health Reform for HHS, said the final rules simplify and clarify the definition of religious employers and make it clear that they don’t have to “refrain from providing services,” such as charity-related work, that they typically do. He also said the way these contraceptive services will be delivered “insulates the providing organization,” referring to a change in the finalized rules that outlines how insurance companies will reimburse nonprofit religious organizations, including religious hospitals or universities, that object to contraceptive coverage. In the rules, HHS acknowledged it had received many comments urging the agency to extend the exemption to include nonprofit secular employers and for-profit employees with religious objections to providing contraceptives. The mandate does not include a conscience clause for employers who object to such coverage on moral grounds. But HHS said it “declined to adopt” the suggestion to widen its exemption for secular employers who object to the mandate on moral grounds. Good Catholic employees will simply NOT use the coverage provided. Non-Catholic employees, on the other hand, should be given the same benefits as any other American citizen.